Component failure, theft and vandalism can cause severe disruption to the network and therefore significant delays to passenger and freight traffic. Minimising delays and effectively managing the situation to clear faults and obstructions quickly is essential. 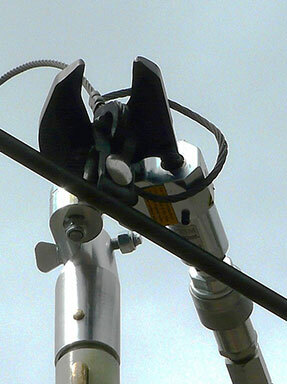 Problems within the overhead catenary system often requires the use of specialist road/rail vehicles with hydraulic platforms to enable engineers access to components that require attention, remove objects or to clear over hanging vegetation. Deploying specialist vehicles to site can be time consuming causing additional delays in faults being cleared. Network Rail identified an urgent requirement to supply portable cutting equipment which ideally could be used with standard OHL Engineer’s insulated pole sets, therefore negating the need to use specialist road/rail vehicles. Through research, we quickly established that potential equipment might be available and with some adaptation be suitable for use in the the Rail Industry. 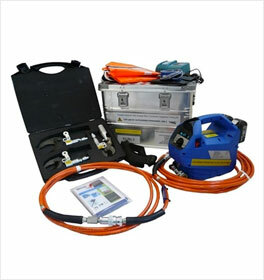 Working with German manufacturer Klauke and provider Horizon Utilities Supplies, a suitable specialist kit was developed to meet Network Rail’s requirements. The solution provided Network Rail with a fully portable, battery powered hydraulic cutting kit that can be easily transported to site. At site, the engineer simply selects one of three cutting heads which is appropriate for the intended application, sets the angle required for the cutting head, attaches the hydraulic hoses and finally attaches the cutting head to the pole sets. Developing a hydraulic force of 10,000 psi, with a reach of up to 12 metres engineers working at ground level, engineers can safely and quickly items such as dropper wires, conductors and vegetation within minutes, keeping delays and disruption to passenger and freight traffic to an absolute minimum. Need to talk to us about your requirements?